AccuWeather.com -- Watery eyes, stuffy noses and sore throats may soon make a comeback in allergy sufferers across the whole of the eastern United States. This year, a combination of the mild winter weather in the East and an early March warmup could result in an intense and early-starting season for sufferers. These conditions may allow trees to pollinate earlier than usual. "The worst pollen concentrations we're looking at will be in the Southeast, just because of the milder air this winter and the rainfall that the area has seen," AccuWeather Senior Meteorologist Alan Reppert said. The highest concentration of allergens will aim for Virginia, North Carolina, South Carolina, Tennessee, Mississippi, Alabama and Georgia. Already, the American Academy of Allergy, Asthma and Immunology (AAAAI) is reporting high concentrations of tree pollen in cities such as Charlotte, North Carolina, and Birmingham, Alabama. Moderate concentrations have been recorded in Charleston, South Carolina, and Atlanta. Farther north, in the mid-Atlantic and Northeast, the occasional bout of wet weather will help to keep pollen counts at bay. April will lend itself to the occasional damp and dreary day across these regions, AccuWeather Expert Long-Range Meteorologist Paul Pastelok said. Doses of wet weather can often be a boon for seasonal allergy sufferers, as rainfall helps to wash pollen out of the air. This will keep concentrations at a moderate level as far northward as Vermont and New Hampshire. February winter weather across U.S. 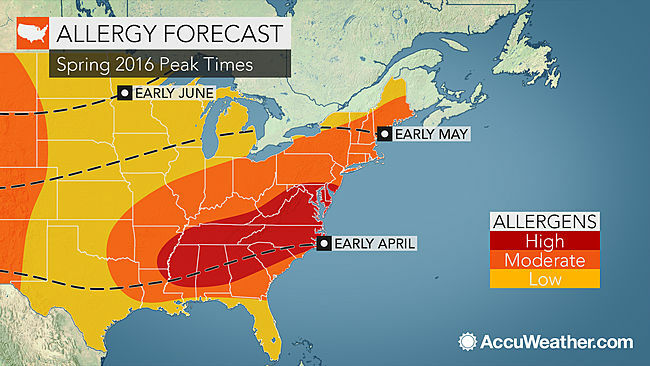 Does spring warmup spell end of winter for eastern US?